Festival Records in Australia released many of Judy's Decca records "Down Under" in the 1950's. Here is another one of their 45rpm 7" "extended play" compilations. 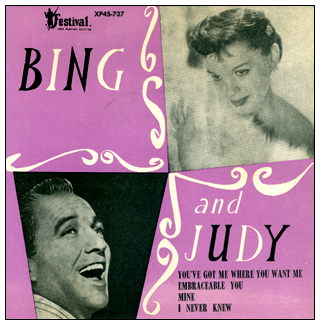 What's interesting about this record is that Judy also recorded a solo version of "I Never Knew", but it's Bing's radio solo backed up by the Bobby Cole Trio that's included here. All of these recordings (except Bing's solo with the Bobby Cole Trio) can be found on the 1994 CD boxed set "Judy Garland - The Complete Decca Masters	(plus)." All images from the collection of Craig Hackman.